Hello Dealsnloot Readers,Myntra End of Reason Sale : Get upto 80% Off + extra 10% Cashback via SBI Cards. Myntra End of Reason sale 2-3 july 2016, Myntra end of Reason sale upto 80% off + Extra 10% via SBI cards. India’s Biggest Fashion Sale is now here – Myntra End of Reason Sale to be held on 2nd-3rd July 2016.This is the biggest fashion sale you would have ever seen in this year where you get branded products like Puma, Reebok, Adidas, Nike, Lee, Hush Puppies etc. at upto 80% off. Yes, you can now purchase those expensive sneakers worth Rs 5000 at just Rs 1000 and what not ! This is the best time of the year to leave no “reason” for not shopping !Also, you will also get extra 10% cashback if you pay using SBI Debit/Credit Cards. 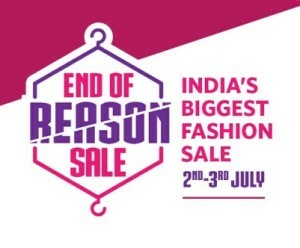 So Get Ready to buy all your Fashion Products in Myntra End of Reason Sale!! #TaiyyarHoJao So Grab This Loot Deals Sale. Note : - My Suggestion Is Try To Use Mobile Myntra Site Using Our Link To Get Instant And More Loot. 2) Login or Sign up for your Myntra account. 3) Select your products & Add them to your cart. 4) Review your cart and then click on Place Order. 5) Apply Coupon Code – if any mentioned. 6) Now Enter your Delivery Address & other Details and click on Continue. 7) Select your Payment Method as SBI Debit/Credit Cards to get extra 10% Cashback on your order and proceed to the payment. 8) Complete your transaction and place your order. Sale will be live from 2nd july 2016. Myntra end of reason sale is valid from 2nd July 2016 to 3rd July 2016. Get upto 80% off on product may sold out very soon so keep your eyes on this discount. Up to 70% off sale on myntra will remains in stock for long time. Get additional 10% cashback from debit & credit cards. Get 10% Cashback from SBI Bank debit & credit Cards in Myntra end of reason Sale. PUMA – All styles on discount. Great deals on iconic products (Ferrari, Ignite and more). 800 new styles exclusively added for the sale. Jack & Jones – All styles on discount. Minimum 60% Off on 1300+ styles. NIKE – Iconic products (Airmax, Air Jordan & more) on lowest prices ever. Min 50% Off on more than half the styles. Flat Rs. 2500 off on top shoe styles. Roadster – All styles on discount. 4000+ styles under Rs 999. United Colors of Benetton, U.S. Polo Association – All styles on discount. Flat 50% | 60% | 70% Off on best-selling styles. Mast & Harbour – All styles on discount. More than half the styles at minimum 50% Off. HRX – All styles on discount. Minimum 60% Off on 1300+ styles. Forever 21 – Flat 30% Off on all styles for the first time ever! Biba – All styles on discount. SS’16 on discount for the first time. Min. 50% Off on more than half the catalog. 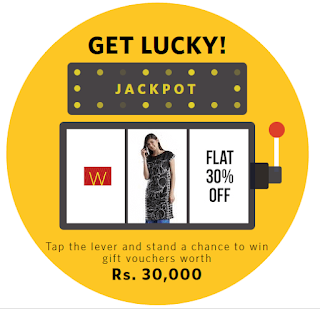 1) Visit here to play the Jackpot Offer Scroll Down. 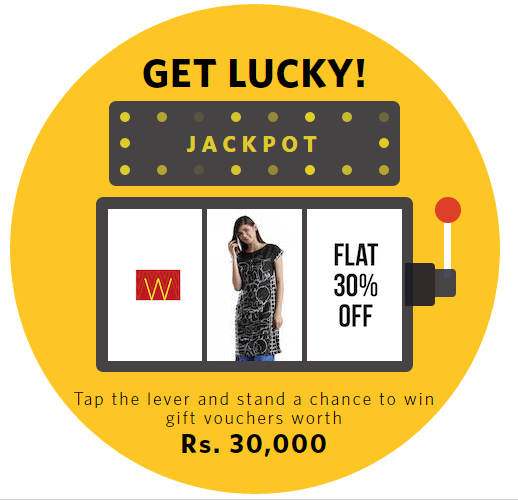 2) Tap the lever and stand a chance to win gift vouchers worth Rs 30,000.